TRUST PREMIERE TO KEEP YOUR CHILD SAFE ON THEIR BIG DAY! Items marked with * require a $300.00 non-refundable deposit. You’ve been anticipating this night for what seems like forever… and no doubt you’ll remember it for the rest of your life. That’s why everything’s got to be just right! Premiere’s vehicles are guaranteed to impress. From the time your driver arrives, to the moment you’re safely home, you can rest easy knowing Premiere has a reputation for safety and professionalism. Our attention to safety is second to none, we provide new vehicles, background checked and drug tested chauffeurs as well as 5 million dollar liability policy. Don't just pick a vehicle for your son or daughters prom, trust someone who is focused on providing a safe and reliable vehicle. Click to see our superior selection of Limousines & Specialty vehicles. 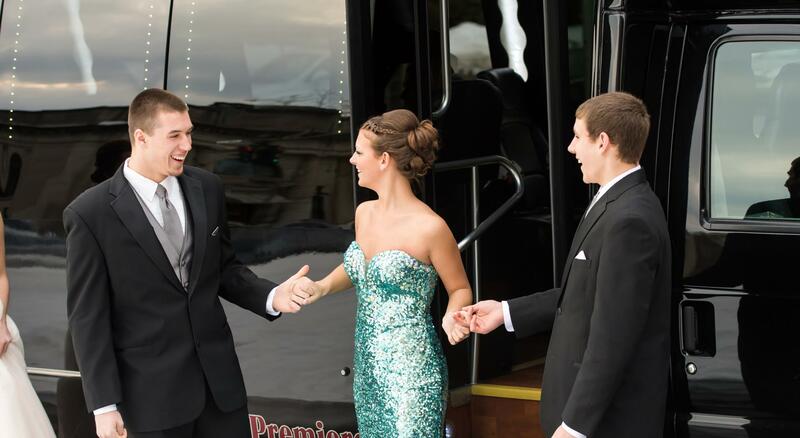 Premiere enforces a strict no alcohol/no drug policy for Prom groups. Premiere requires that a prom pledge be signed by each student in the vehicle as well as their parent or guardian.